El bundt cake quedó fantástico, con un delicioso sabor a almendra y con las cerezas en el interior... Como podéis ver en las fotos, ¡superatractivo! No tengo ninguna duda, ¡esta receta la voy a hacer más veces! The Bundt cake turned out great, really nice almond flavour (not too much) and the cherries in the middle... well, as you can see on the pictures.... just lovely! Definitely going to try this one again! Combina en un cazo mediano 50 g del azúcar con la maizena. Incorpora, removiendo, las cerezas, el zumo de naranja, la ralladura de limón y ¼ del extracto de almendra. Llévalo a ebullición a fuego medio-fuerte, y déjalo cocer, removiendo de vez en cuando, durante 5 a 7 minutos (o hasta que la mezcla se haya espesado y reducido bastante. In a medium saucepan, combine 1/4 cup (50 grams) of the sugar with the cornstarch. Stir in the cherries, orange juice, lemon zest and 1/4 of the almond extract. Bring to a boil over medium-high heat and cook, stirring occasionally, for 5 to 7 minutes, or until the mixture has thickened considerably and reduced to about 1 cup. Mezcla bien la harina, la harina de almendras, la levadura química, el bicarbonato y la sal en un cuenco mediano. Whisk the flour, almond flour, baking powder, baking soda and salt in a medium bowl until thoroughly combined. En el cuenco del robot de cocina, con las varillas, mezcla la mantequilla con el azúcar (200 g) y el aceite vegetal unos 2-3 minutos hasta obtener una mezcla ligera y suave. Añade la vainilla y 1 cucharadita de esencia de almendras. Añade los huevos, de uno en uno, batiendo bien después de cada uno. In the bowl of a standing mixer fitted with the whisk attachment, beat the butter with the sugar (200 g) and the canola oil on medium-low speed for 2-3 minutes, until light and fluffy. until thouroughly combined. Beat in the vanilla and the remaining 1 teaspoon almond extract. Add the eggs, one at a time, beating well after each addition. Con el robot a baja velocidad, y batiendo sólo hasta que se haya incorporado, añade la harina en tres fases, alternando con el yogur (en dos fases), empezando y acabando con la harina. With the mixer on low, add the flour mixture (in three increments) alternately with the yoghurt (in two increments), beginning and ending with the flour and beating just until incorporated. Cúbrelo con el glaseado de almendra y decora con almendras laminadas... si las tienes (yo no tenía ;-) ). Pour a little more than half of the batter in to the prepared pan. Spoon the cherry mixture directly on top of the batter, then pour the remaining batter over the cherries. Using a knife swirl the batter and cherries together. Bake for 50-60 minutes until the cake is golden and a cake tester inserted in the center comes out clean. Drizzle with the almond glaze and sprinkle with sliced almonds (if you have any, which I didn't ;-) ). Mezcla con las varillas el azúcar, el agua y el extracto de almendras en un cuenco pequeño hasta que quede una mezcla homogénea. Whisk the sugar, water and almond extract in a small bowl until smooth. 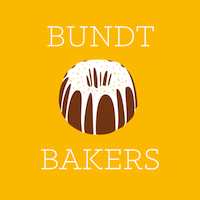 ¡Nos vemos el mes que viene en el grupo de bundt bakers! ¡Gracias de nuevo, Shilpi y, por supuesto, Stacey, por organizar todo esto! See you again next month in the Bundt Baker group!! Thanks again Shilpi and of course Stacey, for hosting!! Gracias Diego!! Jaja, creo que las cerezas son superpopular ahora :-) Voy a echar una ojeada en tu receta ;-) Un abrazo!! Tiene una pinta super apetecible, quizás me coja un trozo, bueno, quizás no..., seguro que me lo cojo. Besines. Jaja, guapa, muchas gracias por tu comentario!! La verdad es que sí, estaba para chuparse los dedos (comí dos trozos grandes como merienda ;-) ) pero siempre hay para compartir ;-) Besines para ti también!! Perfecta combinación, que suelo utilizar mucho. Felicidades! This looks beautiful and delicious! I love the streak of cherries in the cut pieces. Yummy! Thanks June!! See you again next month! Beautiful Bundt... Thanks for participating.. Thanks Laura!! See you again next month! I love that swirl of cherry running through your cake - absolutely beautiful. Love the cherry filling!! Great cake! The filling in a bundt cake really adds an interesting component. Your cherry filling looks super interesting! A beautiful slice of sunshine. Looks amazing! Thanks Cathleen! I totally agree with you! It WAS hard to find the right combo wasn't it? Love your bundt. Cherries and almonds are always perfect together! I've seen cherries and almonds together so many times but I have yet to try the combination. Your cake does look great! Hi Lara, Your cake looks absolutely lovely and so moist! I've combined almond flour and cherries in a cupcake before and it tasted pretty delicious. I'll surely try your cake recipe soon.